WASHINGTON (CNN) -- Missing vials of a potentially dangerous virus have prompted an Army investigation into the disappearance from a lab in Maryland. Fort Detrick is the home of the Army's top biological research facility. 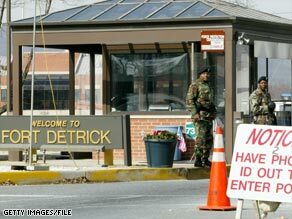 The Army's Criminal Investigation Command agents have been visiting Fort Detrick in Frederick, Maryland, to investigate the disappearance of the vials. Christopher Grey, spokesman for the command, said this latest investigation has found "no evidence of criminal activity." This investigation comes two months after all research at the research institute facility at Fort Detrick was halted for a complete computer-based inventory of all disease samples at the fort. That inventory is expected to be complete before summer and may help solve the mystery of the three missing vials, officials said. The Army investigation is in its final stages and is expected to be closed soon.